While others are acquiring spectacular images of the seafloor with Autosub, I’ve been amusing myself by... um… collecting stones. 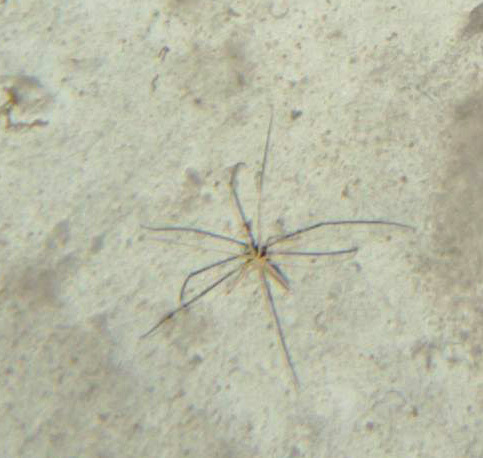 We find these embedded on the surfaces of megacores. Most of the stones originate from the higher points on the abyssal seafloor (i.e. the shallower sites), probably because these are areas where they are exposed by sediment winnowing. chambers strung out along the very narrow tubes that make up the network. A few are ‘clinker’ – lumps of burnt coal discarded by steam ships. Clinker is a very common human contaminant of the ocean floor, which is surprising since steam ships only operated for a period of about 100 years. However, most of the stones are bits of rock, almost certainly dropped by melting icebergs during the last glacial period. They often have a black coating, probably of iron-manganese oxide. Despite initial appearances, deep-sea stones can be quite interesting. The ones that are exposed at the surface provide a hard substrate on which different creatures can settle, and are often teeming with life. A stone with a brachiopod (Pelagodiscus) attached to the surface. Most foraminifera – forams – live in the soft sediment but others fix themselves to hard substrates. We found a wide variety of these attached forams on the stones. Some were simple mud domes, others included extensive networks of fine tubules and flat mat-like formations. But the most common was a delicate net of minute tubules with tiny chambers positioned along them. Unlike most of the encrusting forams, this one has a name – Telemmina. 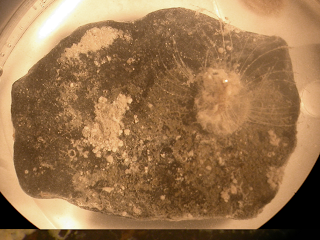 The stones provide sanctuaries on the seafloor for foraminifera and animals that could not survive in the sediment. 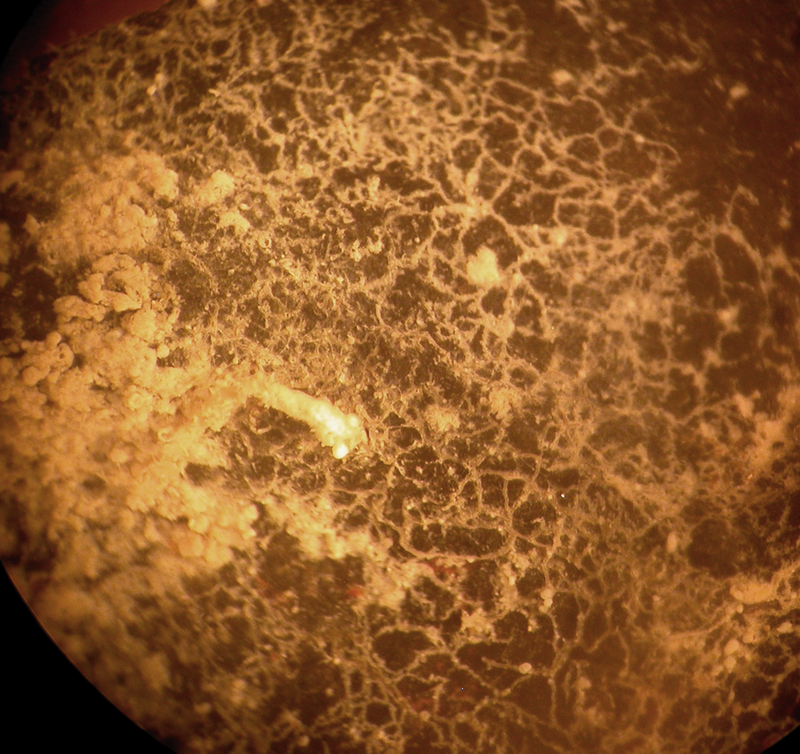 In the Pacific Ocean, manganese nodules are often densely covered with similar organisms. Nodules are much less common in the Atlantic Ocean, so it’s fascinating to see the same kinds of foraminifera settling on stones that were transported from distant continents by icebergs thousands of years ago. The engineers are in charge of the ships engines, machinery, its smooth operation and repairs. It’s an important job and one that keeps the six engineers aboard hard at work. Declan, the 3rd Engineer, passes me a pair of ear protectors as we begin our tour of the engine rooms below deck. The first things you notice are the four diesel-electric engines powering away, each producing 1550 KW. 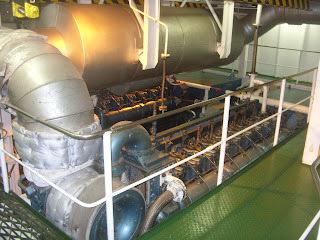 They provide us with the electricity used for the lights, right through to the propulsion of the ship. Below deck there is more machinery that the engineers are responsible for which includes a sea-water to fresh water generator, the hydraulic systems for the winches, refrigeration units for the scientists laboratories and galley fridges, sewage treatment and a pressure system for the vacuum toilets. We reach the control room, which looks as impressive as the ship’s bridge, with read outs for all the machinery’s parameters such as pressures and temperatures. In an emergency, if the bridge is down, the entire ship can be controlled from the engine room control desk. Declan explains that the engine room is an UMS system (unmanned machinery space), which means it doesn’t require full time attention at night. However the UMS computer is linked to the engineers’ cabins. A fault will trigger an alarm alerting the engineer on watch that night to any problem. Arguably one of the most important roles is that of keeping everyone on board fed throughout the three-week journey. With 43 people to feed this is a big operation. 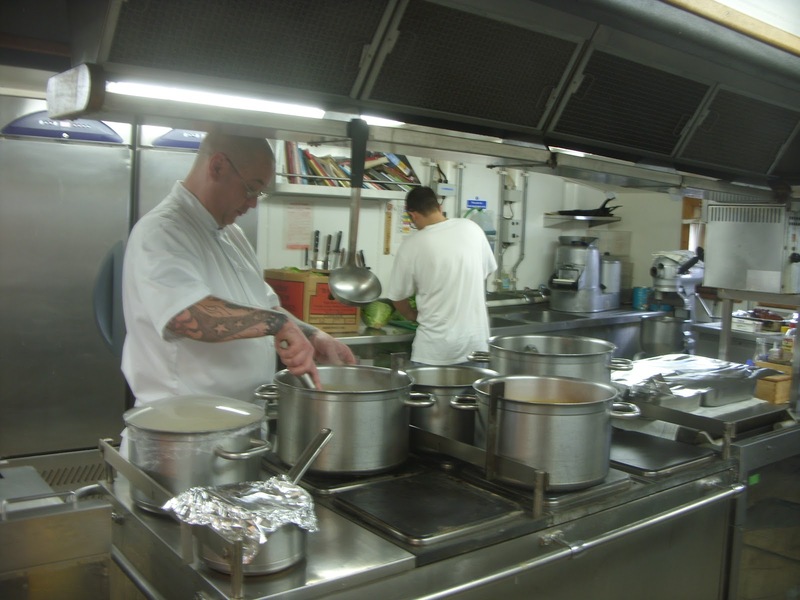 Before our trip began enough food was stocked from suppliers in Southampton to fill two giant walk-in fridges for fresh fruit, vegetables and dairy, and two walk-in freezers for meat and frozen food. There is also an entire room for tinned food and condiments. It has been known for the galley staff to stock the ship from food outlets abroad, such as the Bahamas or Chile. It’s possible to keep the ship fed for six weeks straight, although towards the end there does tend to be less fresh produce. For our trip we are able to enjoy fresh food throughout. The running of the RRS Discovery can be split into three main teams: the officers and deck crew; the engineers; and the catering staff, all of whom are governed by the ship’s Master. In total, there are 21 crew members, each and everyone being vital and working as a close team throughout. It should be pointed out that from the ship’s crew point of view, they are all mariners together, working for the ship herself. It is generally believed that she (the ship) has a soul and most certainly a personality (described as cantankerous at times). The Master is ultimately responsible for the entirety of the ship and all those aboard. 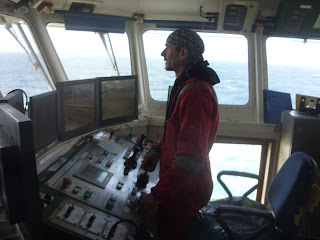 The Master (referred to by the crew as ‘the Old Man’) is the key decision maker on board. In the Merchant Navy, the Master is equivalent to the position of Captain. Peter Sarjeant has been Master for 24 years. Having joined the National Environmental Research Council in 1999 he has subsequently been in charge of the RRS Charles Darwin, James Cook and the Discovery. 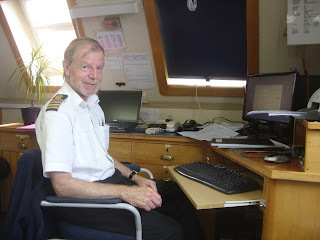 As I sit talking to him in his quarters at the bow of the ship, he tells of adventurous trips of gigantic seas and near misses with hurricanes, I get the impression he very much loves his job, and in particular, the enthusiasm he sees from the scientific team. He tells me of how times have changed over the years. For example when he first began, the weather reports would come in by Morse code and it would be his job to plot out the isobar contour maps by hand. Day-to-day working life entails management meetings with the scientists, officers and chief engineer, writing reports and communicating with shore. On top of that he is on call 24 hours a day. The officers are in charge of the navigation of the ship and are a fail-safe for safe operations. Working 4-hour watches they man the bridge 24 hours a day. Each officer has also to deal with life saving drills, fire fighting equipment and medical matters. Long distance journeys to far-away ports require careful planning. 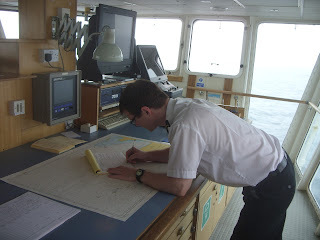 The nautical charts and publications are also checked and updated if required. From the bridge the officers are in contact with the deck crew who work hard to organise the scientific machinery on deck. Working from the winch room, the deck crew will operate winches that can lift up to 10 tonnes of equipment. At the same time the officers on the bridge keep the ship stationary by means of carefully balancing the ship’s propellers and thrusters against the oncoming swell and wind. This is an incredibly skilled task. 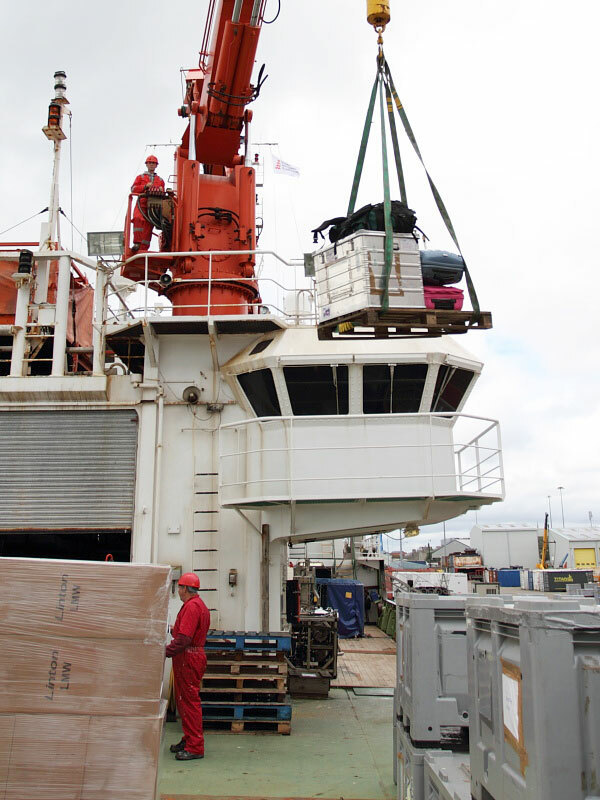 The RRS James Cook has dynamic positioning that automatically keeps the ship on position. The replacement RRS Discovery will also have this feature. But it is the experience and skill of the crew that keeps this 50-year-old vessel on station during deployments. This is the main event! 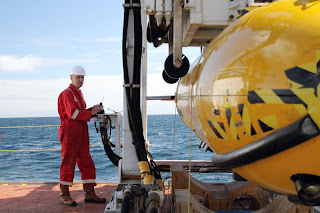 We mentioned before that Autosub6000 was being prepared for duty, and after a furious couple of weeks of work at Porcupine Abyssal Plain, the sub has successfully completed seven missions, collecting bathymetry data and over half a million photos of the seafloor. These surveys are designed to gain a broader perspective of how communities might differ between abyssal hills and flat areas, which is similar to understanding how communities of animals might change as one moves from a valley to the summit of a mountain. On land it is easy to confirm on the ground what we can see from satellite photographs, but this is far harder in the deep-sea because we can’t see through the water using light. 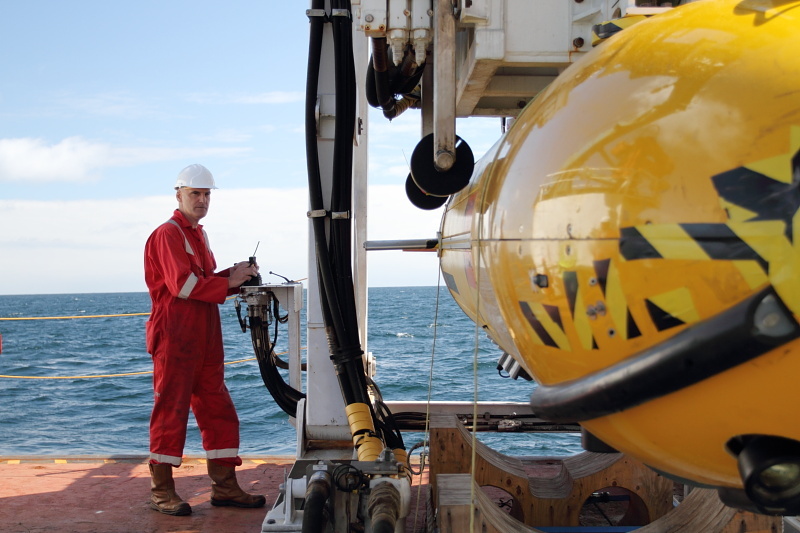 Instead, we have to use sound-based mapping techniques such as sonar to map large areas of the seabed and confirm them with remotely taken samples like those from the megacorer or photographs. The benefit of using Autosub for collecting photos of the seafloor is that it can cover vast stretches of the seabed quickly while collecting a huge number of photos, along with other data about the environment. The photo transects we’ve collected during this cruise span an area about the size of a medium-sized city, enabling us to view a greater area of the abyssal landscape than has been generally possible for deep sea areas. Autosub has been deployed with two cameras. 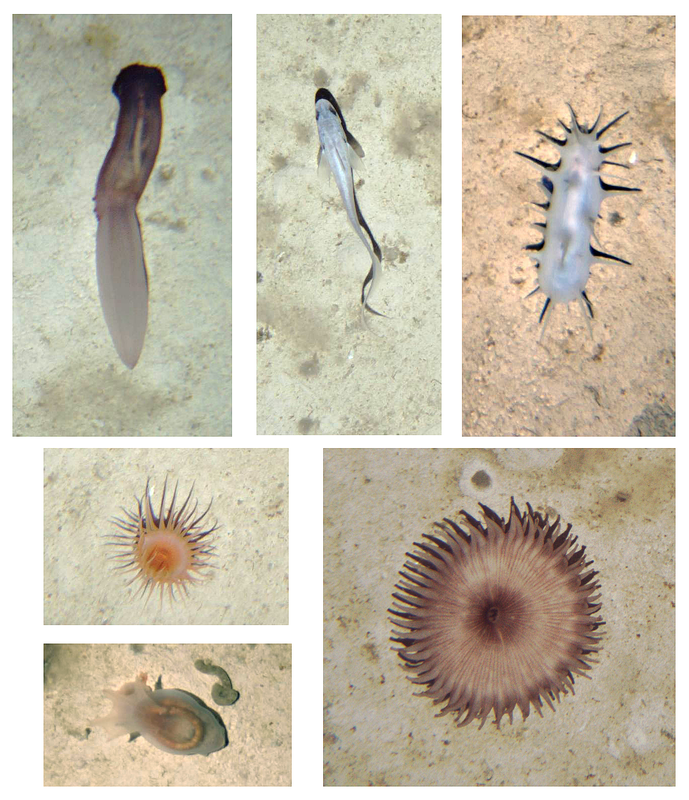 The downward facing camera takes photos directly below Autosub, and these photos are used to assess the number and types of invertebrates that live on the seafloor in different areas of the plain. Sea cucumbers are the dominant type of large invertebrates that we see in the abyss, and there are at least ten different varieties in our photos. Autosub takes one photo every 0.8 seconds, so the photos overlap. This overlap means that photos can be stitched together into long strips, giving a continuous picture of the seafloor. In just a few days, we have taken more than 300,000 photos with the downward camera, which will take months to analyse! The forward facing camera is being used to look at the numbers and distribution of abyssal fish. Fish decline in number rapidly with depth, with only a few species able to survive on the limited food supply in the abyss. The rarity and mobility of fish means that surveys must cover large distances to determine their distributions over the seabed, which is why Autosub is such a valuable tool. 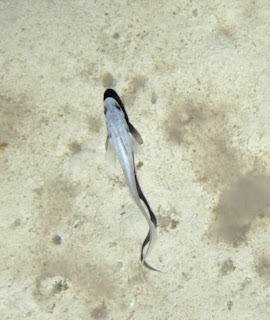 Fish species in the abyss look quite different from fish that you see at the fishmongers; they are dominated by eels and rattails, and are typically scavengers that can cover long distances using relatively little energy to try and find food. We need to use a forward-facing camera to monitor fish because they are mobile, so can be startled and swim away before being seen by the downward facing camera. So far, we have collected around 250,000 photos, which means lots of fish to look for! In addition to Autosub, we have used SHRIMP (Sea floor High Resolution Imaging Platform) a towed camera system, to photograph one area of cliffs that was too steep for Autosub. The SHRIMP system had forward and downward video cameras and a downward facing still camera. Using this, we were able to see some rare rocky outcrops in the abyssal plain! This was really exciting, since this environment is largely flat and covered in muddy sediment. As we come to the end of the highly successful Autosub missions at the Porcupine Abyssal Plain and anticipate exciting new finds, we find that we are positively swimming in photos! We are collecting samples of the seafloor sediment for their particle size distributions to be analysed. This information tells us about the basic seafloor environment that animals live in and on. We already know that they live at high pressures, low temperatures and without light, but what is the bottom like? The seafloor has hills and flat areas that are surveyed with bathymetry, and we can add the particle size of the sediments to that information. Due to the interactions of particles with ocean currents, the particles on higher areas can be coarser (i.e. sandy), than areas in valleys or flatter areas, where there can be higher proportion of very small clay particles. Core samples are sliced into several depths, and will be analysed at NOC. We shine a laser into the samples, and measure the light diffraction to find the size of the particles, since particles of different sizes bend the light at different angles. We can then determine the proportion of particles of each size. Much of the sediment at the Porcupine Abyssal Plain is very soft and light brown in colour. We were very interested to see stones that have fallen from melting icebergs. These stones have travelled far from the continent, and provide a hard surface for some fauna to grow on. Clinker dropped from steam-powered ships provides other hard surfaces. Sediment contains organic matter that falls from the surface ocean, which is consumed by deposit feeders such as sea cucumbers. Soft sediment with small particles is important for feeding and for fauna that bury themselves into the sediment. Looking at particle size differences at different locations around the plain can give us important information about spatial differences in faunal communities in the deep, potentially explaining why we might find differences in one area when compared with another. 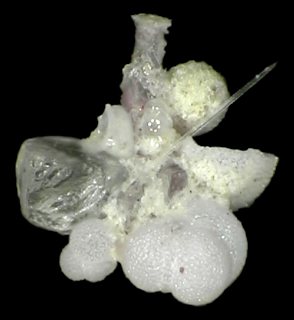 Forams are single-celled organisms, which can be found living in deep-sea sediments. Benthic forams, which live in the seabed, are among the most common organisms living in today’s oceanic environments. 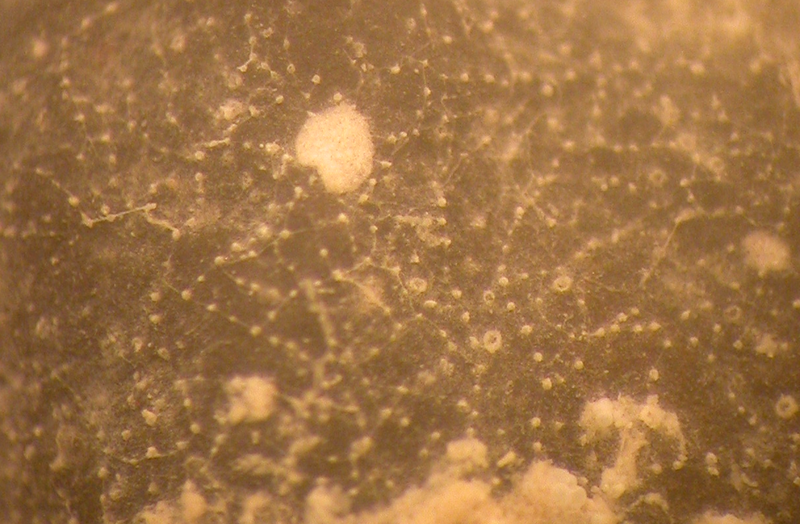 Forams come in many different shapes and sizes and their structure can be quite elaborate. They have a test (shell), which is made either of calcium carbonate that they secrete, or from agglutinated sediment: bits of fine sand and sediment particles that the forams find on the sea floor. Foraminifera are being collected on this cruise using the megacorer. This device takes sediment core samples from the ocean floor. The megacorer is lowered off the side of the ship to the sea floor to depths of around 4800m where the cylinders are pushed into the seabed. 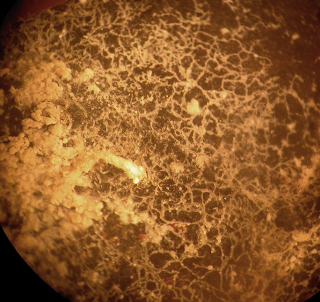 The megacorer is used to collect both macrofauna (organisms retained on a 300 μm mesh) and meiofauna (organisms that pass through meshes of 500 μm but are retained on a 40-69 μm mesh). 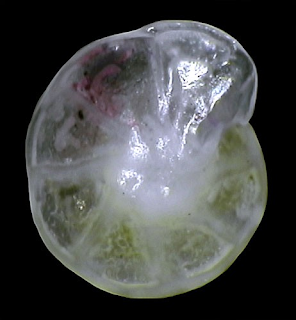 The foraminifera fall into the group meiofauna because of their size. Macrofauna samples are collected in 100mm diameter cylinders, whereas meiofauna, (because they are smaller) are collected in 70mm diameter cylinders. Once back at the surface, the cores are taken off the megacorer and into the laboratory on the ship where they are sliced horizontally into twelve depth layers. 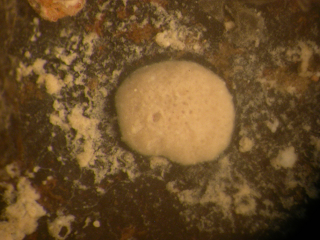 Hundreds of forams can be found just in the top one cm layer of a megacore slice. The samples collected during the cruise will be taken back to Southampton and used to understand the vertical distribution of forams throughout the sediment layers. 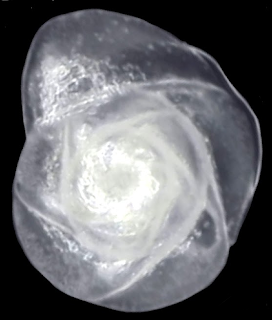 Also, the relationship of foram distribution to the topography of the sea floor at the Porcupine Abyssal Plain will be investigated. Being on a research trip does have some pretty amazing benefits, such as wildlife watching! So far we have been lucky enough to see a wealth of marine creatures from the ship. We have seen long-finned Pilot Whales (Globicephala melas), which are generally found in temperate waters and live on a diet of squid and fish. They are in fact members of the dolphin family, the biggest one in the picture is around 5 metres long. 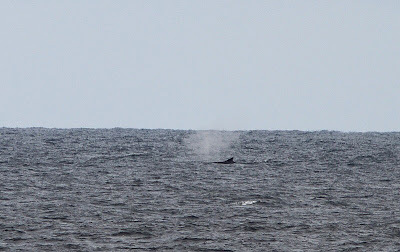 We saw a pod of whales that contained five or six individuals, which stayed along side the ship for around half an hour. Some of the scientific team came equipped with some pretty impressive camera gear. A photo, taken by Rosanna, captured the moment a family of pilot whales surfaced as they swam by us. We have been lucky enough to see Fin Whales (Balaenoptera physalus), for these creatures are endangered due to the whaling industry around the world. If it wasn’t for their spouts that go several metres up into the air, we may not have been alerted to their presence at all. They are large at about 20 metres long and are the second biggest creature in the ocean, only surpassed in size by the blue whale. 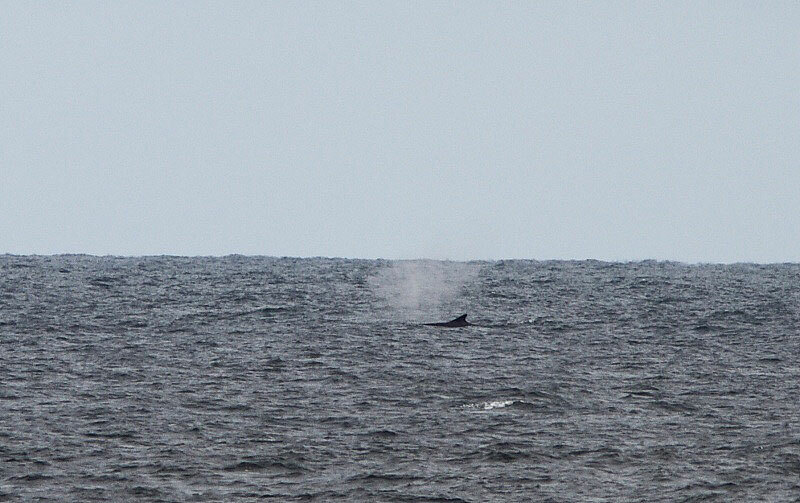 We were able to clearly see their long backs and dorsal fin. They appeared to be travelling in pairs, as we could see two spouts blowing next to each other. From the literature we guessed that they were feeding when we saw them, as they would blow 5 or 6 spouts in quick succession before disappearing beneath the surface for 10 minutes. The day that we were at the Goban Spur site we briefly saw dolphins. They were popular with all on board and drew a good crowd of people. The common dolphin (Delphinus delphis) with its distinctive slender body and long beak is probably the best-known species of cetacean. Although we weren’t graced with an acrobatic display, we did witness them jumping through the waves. Gannets have been around us for most of our journey, either gliding effortlessly along the tops of waves or flying just above the ship. They are among the largest seabirds in the northern Atlantic with wingspans of up to 2 metres. They feed on fish and squid by means of plunge diving into the ocean from heights of up to 40 metres and speeds of 60 mph. The ones we saw will probably breed in the UK or Ireland, but out of breeding season they will spend their time continuously at sea. They are migratory birds and will overwinter in the tropical waters off the West Coast of Africa. Other marine creatures that have been spotted have included jellyfish and sunfish, fingers crossed: we may get some more sightings before the end of the trip. Well, we’ve had an exciting few days out here and have just had our first data download from Autosub. After some rough weather and some troubleshooting, we are now collecting some of the great high-resolution data we’ve been waiting years to see. 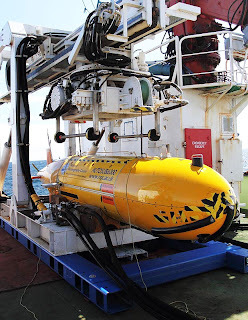 Autosub was launched yesterday afternoon to do its first mapping mission at the seafloor. We took some test shots with the downward-facing camera to make sure the focus and lighting was set up correctly to create the habitat maps that we want. After a long dive to the seafloor, it finally reached 4800 m, oriented itself correctly in relation to the ship’s GPS and conducted a 10-minute photographic test flight approximately 3m above the seabed, which is extremely close for this kind of vehicle! Thankfully everything went exactly according to plan, and the cameras functioned very well, taking images approximately every 0.8 seconds and recording a total of 1600 for us in just 10 minutes! When we start doing the longer missions we’re going to have a lot of image processing to do. 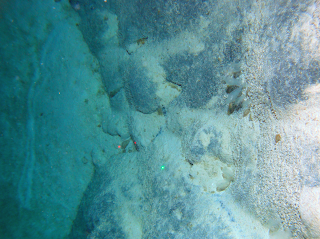 Still, even in such a short dive we still got some very good images of the benthic megafauna. 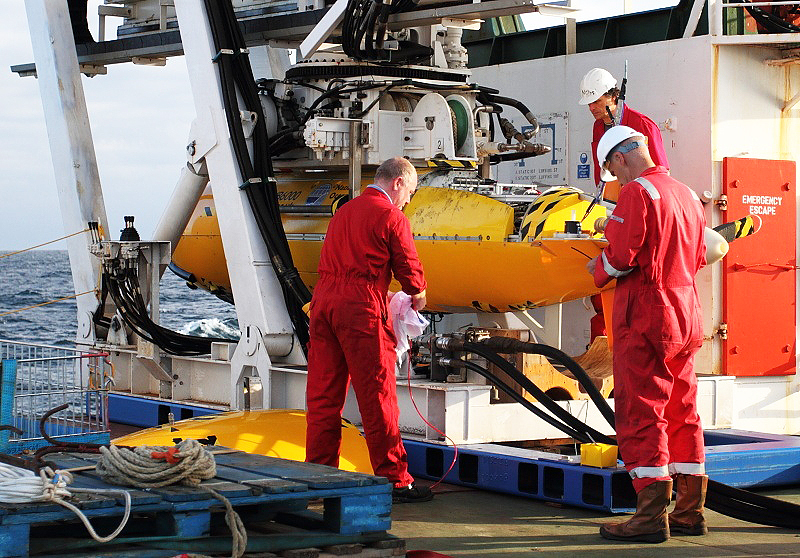 After the test run was complete, Autosub continued with its primary mapping mission, using multibeam sonar to produce an extremely detailed map of the seabed. We’ve only completed a small part of the total area we’re hoping to cover, but you can already see in the image below how the resolution of the new map compares to the map we made previously using ship-based multibeam acoustics. The term bathymetry is the oceanographic equivalent to topography – the shape, highs and lows of the ocean floor. Think of the word ‘bath’. Compare the Autosub bathymetric data on the left with good quality ship-based bathymetric data on the right. The resolution in the squares on the right is about 50m, whereas the Autsub data contains more than 50 times more detail. 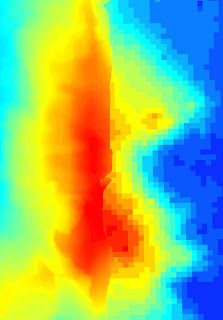 In this image the warmer colours indicate a higher bathymetric area, whereas the deeper areas are blue in colour, ranging from about 4600 to 4850m depth. As you can imagine we spent much of the day going through the catalogue of data that was collected in just five hours of seafloor mapping. There was lots of gathering around computer screens. Autosub’s next mission is planned for tomorrow, the aim of which will be to continue bathymetric mapping a bit more of the study area before we start with the large-scale photographic surveys of the benthic megafauna and fish. 3am start – yuck! I have been assisting with processing the megacores for prokaryote analysis. These are organisms that don’t have a cell nucleus (like bacteria for example). I have also been involved in work with the microbial sampling and CTD operations (Conductivity – salinity, Temperature and Depth). This work involves collecting water from 12 sample depths using the CTD rosette. 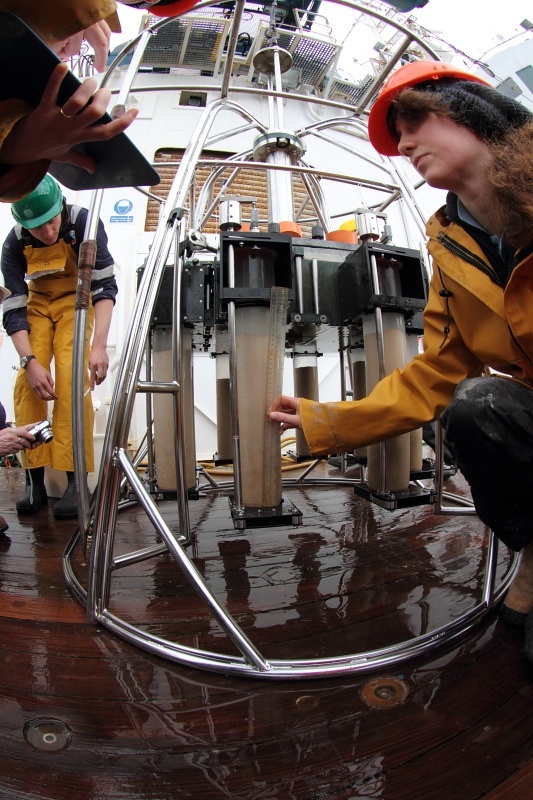 As the CTD is lowered through the water column, the data is streamed live to a computer screen where we can see profiles of temperature, salinity, depth, oxygen, chlorophyll and turbidity. The sensors in the CTD are rated so that they can travel to depths of up to 6000m. The 10 litre niskin bottles are then fired on the way back up to the surface. The water is collected and either processed immediately or stored in 2°C to help slow down degradation. Ten litres from each depth is then filtered through a two-stage filtration unit. Water first passes through a GF/F filter to sample algae and phytoplankton. The second filter, which is contained within a sterile plastic tube, collects free-living and particle bound prokaryotes. The filters are then stored at minus 80°C. 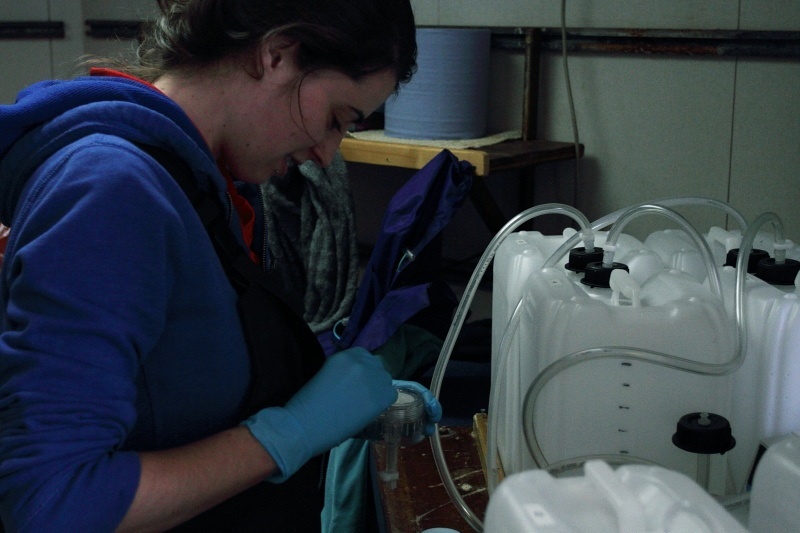 DNA and RNA will be extracted from these filters back at the lab to assess the microbial community composition and functioning in the water column from the Porcupine Abyssal Plain. These communities essentially control a big part of the carbon cycle, linking the atmosphere to the sea. Some of organic matter produced by the phytoplankton on the surface sinks to deeper depths and is processed and digested by the prokaryote communities converting it to back to simpler forms of carbon like CO2. This process results in CO2 being transporting from the surface to the ocean’s depths, including its sediments. Understanding the composition and structure of these communities at different parts of the water column therefore helps inform as to why we see variations in the transport of carbon to deeper depths. I am on board as a foreign observer under the Foreign Vessel Observer Scheme managed by the Irish Marine Institute. Under the United Nations Convention on Laws of the Sea (UNCLOS), the Marine Institute has the authority to place Irish observers on foreign research vessels in Irish waters, like this one. My role as an observer is to report and document the research activities carried out on board. In this role, I also ensure that the type of research work and the area under investigation conforms with the official notification documents submitted by that country to the Irish Government and act as an official channel in the case of communications between the vessel and the Irish Government, should the need arise. 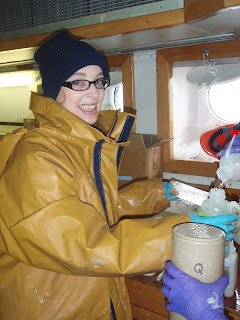 Annette Wilson, PhD Student at NUI Galway and Foreign Scientific Observer for Marine Institute, Ireland. We know very little about animals living at the abyssal seafloor. However, they are part of important biogeochemical cycles, including the carbon cycle. We need to increase our understanding of their functions and temporal variability to predict not only their fate under climate change but also how they can influence carbon processes at the seafloor. I am looking at the macrofauna that are found in the sediment. These tiny animals are measured in micrometres – one millionth of a metre, or one thousandth of a millimetre – µm. The ones I am looking for measure between 300 to 10 000 µm. 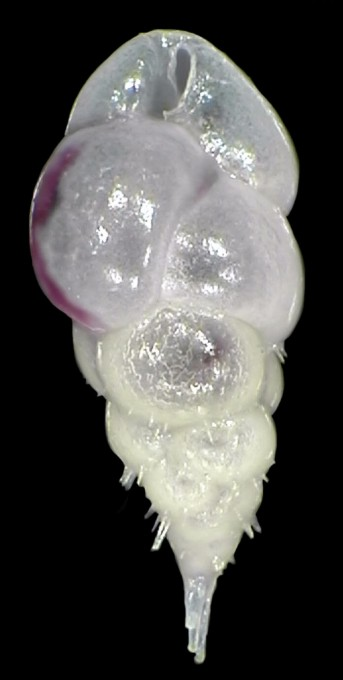 Bivalves, crustaceans and worms are among the inhabitants of the abyssal plain. Marine worms are the dominant fauna of these communities. I am particularly interested in how the marine worm population varies over time – the temporal variation. Do they change from year to year? Is the change in terms of number of individuals or in terms of present species or both? Can we relate the change to environmental factors such as primary production (the amount of plankton) in sea surface water? Since 1989 cores have been taken at PAP to investigate these questions. Part of the process is done on board. The cores need to be put into a temperature controlled cold room and then sliced at 0-1 cm, 1-3 cm, 3-5 cm, 5-10 cm and 10-15 cm layers and then finally are preserved in formalin. The sieving and sorting of the fauna will take place back to the Natural History Museum and NOC. Processing cores is a long task but we have very motivated teams onboard making it a lot easier, which is good as we should collect more than 120 cores for the marine worm study! By Claire Laguionie-Marchais, a PhD student at the National Oceanography Centre, Southampton and the Natural History Museum, London. Autosub is being prepped for its first 20-hour mission to the abyss. It will be taking some test photographs of the seabed to make sure the cameras are set up correctly, then it will start mapping the seabed using the side-scan and multibeam sonars to produce a high definition map of the seabed across our study site. 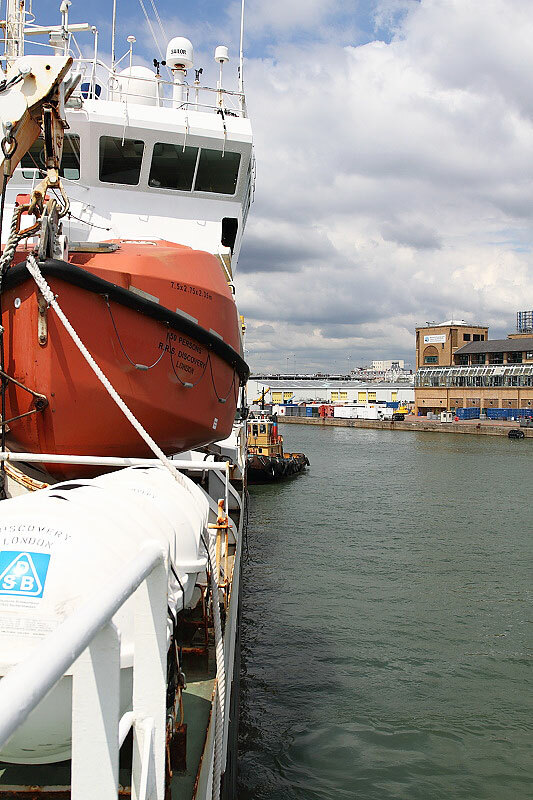 It’s been a busy few days on board the RRS Discovery, with plenty of work going on to keep us busy around the clock! Since arriving at the Porcupine Abyssal Plain we’ve been mostly kept busy processing a steady stream of megacore samples which we’ll use to ground-truth the photographic and acoustic data that is collected by Autosub during its missions to the seafloor. 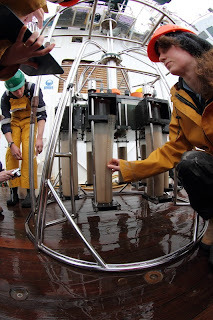 Over the next few days we’ll be blogging with details about the sediment cores collected and how they will improve our understanding of the spatial scale of benthic processes occurring at the Porcupine Abyssal Plain. The internet is extremely intermittent out here, so it's a case of trying to jump on it when we get a window! ﻿The good weather is still holding though, which is good news since it means we can keep working pretty easily, and also makes it far easier to spot whales! I'm studying possible effects of oil pollution in the deep-sea on ecosystem function. I will do this using sediment cores collected from the 1000 metre deep seafloor on the coastal shelf at Goban Spur. I will add hydrocarbons from a mixture of crude oil and seawater, and measure respiration rate of the living organisms in the mud. I'm running this experiment for my PhD. We will be arriving at Goban Spur Saturday morning and the first task will be to deploy a CTD to collect water samples. CTD's measure Conductivity (salinity), Temperature, and Depth. I will be taking these samples from as near to the sediment-water interface as possible. This is so that I can make up a water accommodated fraction of crude oil and bottom seawater – by mixing the two together slowly for about 24 hours. I will add this in serial dilutions to replicate cores and also run a set of control cores to which I will only add clean bottom seawater. I will then seal the core tubes to make them into experimental microcosms, keeping them at ambient bottom water temperature in an incubation chamber. I will measure the declining oxygen concentration in the microcosms over about 48 hours and at the end of this slice and preserve mud from the top 10cm for later analyses of the bacteria and fauna present. I will also collect a set of ‘background’ cores at Goban Spur. These cores will not be used in the experiment but will instead be sliced and preserved immediately. Later I will compare bacteria and fauna present in these cores with the experiment cores. Today’s blog is brought to you by Charlie Main, a PhD student at NOC. Today we wake to a calm ocean, blue sky and for the first time since leaving Southampton not a glimpse of land! Our first stop, Goban Spur, should be reached by early Saturday morning, this is where Charlotte Main is looking forward to gathering her sediment core samples allowing her to begin her crude oil impact experiments. From there we continue to Porcupine Abyssal Plain and so the ship’s scientific teams have been busy over the past couple of days preparing our sampling equipment for our arrival. We have the Autosub team, consisting of Stephen McPhail, Maaten Furlong, Miles Pebody and Dave Paxton. They have been working long shifts to finalise the Autosub for its first mission in a few days. The Autosub has had years of technical work put into it, but the 2 -3 days prior to its launch are critical for its success. Diving to 4,850 metres is no mean feat and everything has to be perfect. Once deployed Autosub will capture two photos per second over an 18 hour mission, generating over 100,000 photos (around 1 terabyte of data), no one wants to find out that the flash ended up not working! So the team have been writing computer code for running diagnostic tests to make sure everything is fine. Brian Bett explaining the principles behind the megacorer. by the force of a 400kg lead weight! Preparation has also been taking place with the box corer and mega corer. Today all the scientists have been given demonstrations on how these samplers operate, so that when operations begin, all goes smoothly. With the number of samples generated by these two units, most of the scientists on board will be helping to process the data, working around the clock. The next few weeks are going to be hard work, but immensely enjoyable. We are all looking forward to tomorrow where we shall gather our first set of scientific data. After a busy few days getting the ship packed up and everyone on board, it is finally time to leave Southampton and set sail for the abyss! On this cruise, we’re hoping to answer some fascinating questions about how variable the deep-sea environment really is, and what this means for the animals that live there. Deep-sea environments have traditionally been considered to be highly stable and relatively unchanging over long periods of time and over large spatial scales. However, there is increasing evidence that deep-sea systems may be far more heterogeneous and dynamic than was previously thought, and so one of the major aims of this cruise is to assess how the abundance and diversity of deep-sea organisms varies over a range of spatial scales (from metres to 10 kilometres). In order to do this, we intend to travel to the Porcupine Abyssal Plain (PAP; approximately 350 miles from Southampton) to conduct highly detailed surveys of the seabed using an Autonomous Underwater Vehicle (AUV) called Autosub6000 which will hopefully allow us to understand how abyssal animals utilise fine-scale variations in habitat and how they are distributed over the seafloor. For this expedition, Autosub has been fitted out with two time-lapse camera systems; the first is a colour camera which points vertically downwards and will be used to create a photographic mosaic of the seabed and to analyse the distributions of invertebrate megafauna, while the second is a black and white camera which has been set up to capture images of fish and other mobile fauna occurring in front of the AUV (hopefully before they are startled by it!). In addition, Autosub6000 is fitted with multibeam sonar and a sub-bottom profiler which will allow us to create an extremely detailed map of the sediments on the seabed and will help us understand how the seabed is changing over a range of spatial scales. By tying together the acoustic (physical) and photographic (biological) data, we hope to be able to determine the amount of spatial heterogeneity present at the PAP. Of course, there is also a need to collect samples from the seabed so we can ground-truth the image data we are collecting and make sure that what we think we are seeing is accurate. So while the Autosub is underwater on one of its 20 plus-hour missions, we will use the time to deploy the megacorer and boxcorer which will hopefully provide plenty of samples for us to assess sediment grain size, the abundance and diversity of the infauna (animals that live in the sediment), bacterial counts and much more. En route to the PAP site we will make a stop in shallower water at a site called the Goban Spur so Charlie Main (NOC PhD student) can collect sediment and water samples to start her experiments to study the effects of crude oil on infaunal seabed community ecosystem functionality, which we will hopefully hear more about from her once everything is set up and running! After that, we head onwards to the PAP site and aim to start working there first thing on Sunday morning (weather permitting!). In the meantime, we’ve got plenty to do to make sure that all our equipment, computers and laboratories are set up correctly and safely for three weeks at sea and that all our systems are ready to go as soon as we arrive on site. For now though, it’s time for the ship’s safety briefing and muster drills so I will sign off now and make sure I can find my lifejacket! Our destination is the Porcupine Abyssal Plain, 300 miles southwest of Lands End UK where we will be conducting a series of mapping exercises that should result in one of the largest scale continuous photographs of the seafloor ever taken, covering an area about the size of the city of Southampton, UK. We will also explore the Atlantic abyss and possible future Marine Conservation Zones using the latest marine technology. The new techniques we are developing will help us understand the effects of climate change on the oceans and contribute to the protection of marine biodiversity. Setting sail on the RRS Discovery during her 50th anniversary year we will have the UK's premier robotic deep-sea survey submarine "Autosub" onboard.